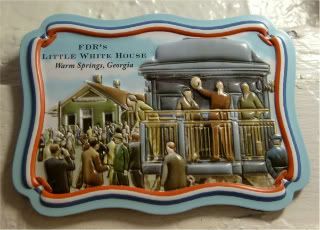 A friend of mind brought her husband to Warm Springs, GA, for his birthday, and brought me back this supercute magnet. They're the same friends I went with to Hyde Park, NY, so it's no surprise that they finally took advantage of being able to visit FDR's other place of residence just an hour south of Atlanta. Back in the 1800s, Warm Springs had been known as a warm mineral springs resort, but by the time FDR had discovered them in the 1920s, it had already fallen on hard times. But, FDR believed the 88-degree waters helped his polio-related paralysis, and so he spent much of his time at the springs, and even kept a Little White House down there, where he supposedly did a lot of his New Deal work. On top of that, he also started the Roosevelt Warm Springs Institute for Rehabilitation, still active today, a place where folks can go and partake of the therapeutic waters, but moreover, it's a place that strives "to empower individuals with disabilities to achieve personal independence." The Little White House is a GA State Park site now, so you can visit it - it's been kept the same since FDR's death, and they have a couple of his special cars, and even an unfinished painting that he was sitting for. Of course, now I have to go rewatch Kenneth Brannagh's Warm Springs HBO movie. Plus, I need to finally read the book I picked up at FDR's Library in Hyde Park, called FDR's Splendid Deception to get a better understanding of FDR and the massive effort to downplay, even hide, the extent of his polio-induced paralysis. It's why I love this magnet, because one of the things I've never been able to get my head around is the public knowledge around his disability. Or rather, lack of public knowledge. Supposedly, no one really knew that he was paralyzed from the waist down, while FDR and his team went to extraordinary lengths to keep this "splendid deception." Ironic, that even on this magnet, from a place where he was trying to remedy his paralyzed legs, he's portrayed standing and waving from the back of the train. And yet, of course, pockets of people knew. The press did what they could to downplay it - which is almost unheard of these days. The government knew. The servicemen and women he visited in a few hospitals knew. The folks of Warm Springs knew. People knew, and they didn't make a huge fuss over it. I've always heard that if the average American public knew that FDR was wheelchair-bound, that he'd never have been elected. While that's probably true, I'd still like to believe that we'd have seen our way around it anyway. Otherwise, how vastly different would this world be? I actually bought the DVD of Warm Springs at Warm Springs, also the full set of Franklin and Eleanor! Love that. Next, we have to do Campobello, Kev has been, but I haven't. Splendid Deception is, well, splendid. Also, check out the newest bio of F&E, it has a very People magazine tone, but interesting nonetheless.